Prong #2 of my Summer Safety Program: Preparation. A well-stocked first aid kit is an essential for anyone who spends time with boys. You don’t have to have an official, pre-loaded first aid kit –but you do need to have the essentials on hand and easily accessible. 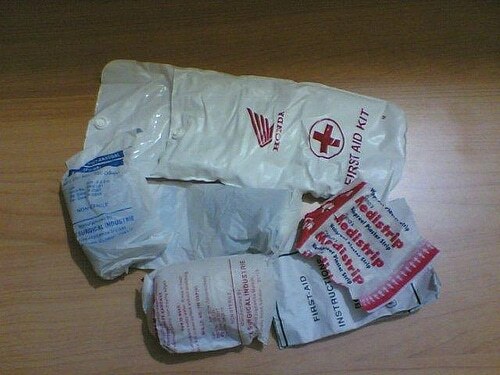 Bandages, in a variety of sizes. Flexible bandages are best for active boys. Generic bandages are fine, and feel free to skip the “extras, such as ointment-infused pads. Special character bandages are great, though — because sometimes, that’s all you need to comfort a crying child. Ibuprofen. Ibuprofen, also know as Motrin or Advil, is often used (quite effectively) to reduce fevers. But did you know that it’s also an anti-inflammatory? That makes it a good choice for sports injuries and bumps and bruises. A dose of oral ibuprofen will decrease pain, and will also decrease the inflammation that can cause increased pain. Ibuprofen should be dosed based on weight. If you’re not sure how much to give your child, check with a physician or pharmacist. He or she should be able to tell you the exact dose for your child’s weight. Acetaminophen. Otherwise known as Tylenol, acetaminophen is another fever reducer and pain reliever. Unlike ibuprofen, it is not an anti-inflammatory, so it’s not the best choice for injuries. It is useful, however, for treating high fevers; sometimes, alternating doses of ibuprofen and acetaminophen can keep a fever under control better than using either drug alone. Too much acetaminophen can be harmful to your child’s liver, so always follow dosing instructions carefully. Like ibuprofen, acetaminophen doses are based on your child’s weight. Ask your doctor or pharmacist to determine the correct dose. Hydrocortisone cream. This over-the-counter cream can be used to soothe bug bites and poison ivy. Apply a small amount to the affected area, and do not cover it with a bandage or wrap. Covering the area unnecessarily increases the absorption of hydrocortisone into the body. Diphenhydramine. Better known as Benadryl, diphenhydramine can be used to treat allergic reactions, as well as seasonal allergies such as hay fever. Taking diphenhydramine after a bee or wasp sting can also decrease the pain and swelling. It comes in both liquid and tablet form, and, again, the appropriate doses depends on your child’s weight. Check with your doctor or pharmacist. Tweezers. Where we live, ticks are a real problem, so we keep tweezers in the first aid kit to remove ticks that have started to burrow into the skin. Tweezers are also useful, though, to remove splinters and other foreign objects. Ice packs. Ice packs reduce pain and swelling after injury. You can use the kind you keep in the freezer, the kind that twist-and-shakes or even a good ‘ol pack of frozen peas. Apply the pack to the injured area as soon as possible after the injury. If the pack feels too cold to the skin, wrap it in a thin towel and try again. Leave the pack in place for 20 minutes or so. You can apply the ice pack for 10 to 20 minute intervals throughout the first day or two after the injury. What else is in your first aid kit?